We pull back the curtain on how exactly we make PodcastPD. We share the tools we use to plan, record, and promote the podcast. Squadcast.fm – SquadCast is on a mission to amplify collaboration. We seek to empower & encourage creatives to engage in meaningful conversations without barriers. Mobituaries with Mo Rocca – Mo Rocca’s long love of obituaries has him led to creating Mobituaries, an irreverent but deeply researched appreciation of the people (and things) of the past who have long intrigued him—from an unsung Founding Father to the first Chinese-American superstar, from Neanderthals to the station wagon. A weekly, term time podcast for the teacher or trainer who wants to love their job and be an amazing teacher without taking work home in the evenings. 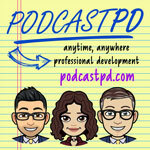 Do you have an education podcast? We would love to promote your podcast on our podcast! Complete this form and we will feature your podcast in an upcoming episode. We welcome feedback on our conversations and you can contact us here.